The explosive new thriller series written by Nicholas Irving, the New York Times bestselling author of The Reaper and star of Fox's American Grit. 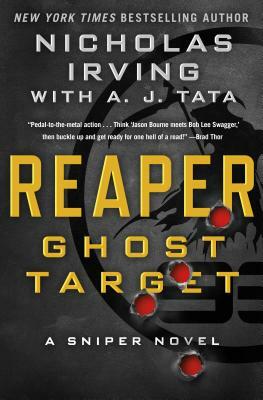 In Reaper: Ghost Target, Vick "The Reaper" Harwood is an esteemed sniper with a record kill count—33 kills in 90 days—when he is knocked out under mortar attack in Afghanistan. He wakes up back in the United States with little memory of what happened, his spotter and gun both unrecovered from the battlefield. Harwood has resigned himself to slowly picking up the pieces of his life, training Special Forces snipers in Fort Bragg, North Carolina, and starting a promising relationship with an Olympic medalist named Jackie. But when a series of assassinations start occurring in the area, Harwood can't explain why he just happens to be nearby for each killing—or how a sniper rifle that matches the description of the one he lost seems to be involved. His memory of the past few days is hazy and full of blackouts, and even he has to wonder, is he being framed? Or is he the killer? NICHOLAS IRVING spent six years as in the Army's Special Operations 3rd Ranger Battalion 75th Ranger Regiment. During his time within the regiment, he served in a wide range of positions, from a demolitions assaulter to a Master Sniper. His position as a sniper marks a milestone in his Battalion's history, as he was the first African American to serve as a sniper. He has since trained the entire 3rd Ranger Battalion sniper section and designated marksman. He is now the CEO and owner of HardShoot, where he continues to train personnel in the art of long range shooting in South Texas. His clientele ranges from the novice long range shooter to the members of the Special Operations community. A. J. TATA, Brigadier General, U.S. Army (Retired), commanded combat units in the 82nd and 101st Airborne Divisions and the 10th Mountain Division. His last combat tour was in Afghanistan in 2007 where he earned the Combat Action Badge and Bronze Star Medal. He is the author of numerous national bestselling novels, including books from The Captain Jake Mahegan and Threat Series. He is the National Security Expert for One America News Network and a frequent foreign policy guest commentator on Fox News and CNN.